I’ve been waiting for this to happen. 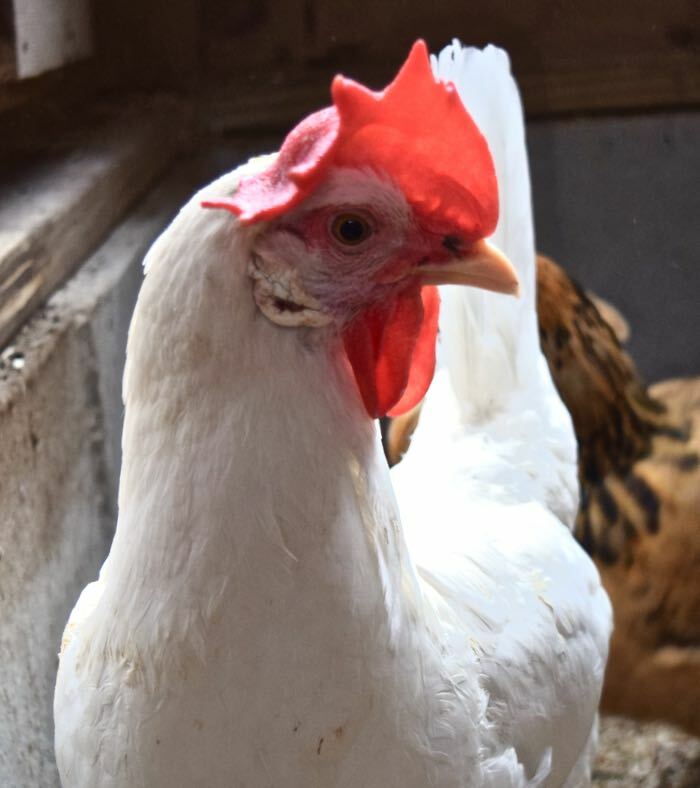 My White Leghorn, Twiggy, who has been an over-achieving layer since the age of 14 weeks, and who has produced almost non-stop for the last three years, is finally having laying issues. This is inevitable with such birds, it was only a question of when and how. Twiggy is still laying almost daily. Her body produces a yolk, which gets surrounded by a white, and then gets encased in a membrane. But she’s not making a shell. As soon as that shell-less egg is laid, it breaks, and Twiggy reaches around to eat it. Twiggy’s bottom is a mess from this. As long as that membrane forms, she’s still able to expel the egg. That’s good. At some point, though, the yolks and whites will not be able to pass easily through the reproductive tract. They’ll solidify, get infected, or back up and fill the body cavity. This is not an unusual scenario. So far, though, Twiggy is okay. I know because Twiggy is active and eating and drinking normally. She doesn’t strain or look distressed while in the nesting box. She’s fully integrated into the flock. No one bullies her. If she was weak, they would. Twiggy’s comb remains a vibrant red. I think she’s rather pleased that she’s making her own daily snack. I don’t know how long this stage will last. We’ll just have to let her be and see. I am going through this EXACT same thing right now! It was a relief to see your post! Aww, poor girl. This aging thing is rough on all of us! You might want to give this a try. I have a Jersey Giant who was laying soft shelled eggs and this fixed the issue. My JG gets 1/8 tsp mixed into a treat every day as late in the afternoon as I can. I recommend buying a 1/8 tsp measuring spoon so you are exact. You want to give the hen as close to 1 tsp per week. And now my JG lays eggs with a nice smooth shell on it each time she lays. I swear by this stuff. Been doing it for just over 3 years now. Here’s hoping that Twiggy remains healthy for a good long time yet. Is the reason for her dirty fluff due to stuff left behind by the shell-less eggs as she passes them, or because she is eating her eggs and it’s is giving her diarrhea? I have an older Black Harco (they are the breed equivalent of your Black Stars) who has had issues with her shell quality since I got her two years ago. She’s 5 now, and still laying so I worry about the quality of her egg shells. Her shells have improved over the last year and a half – still not great, but better – and I attribute it to a combination of feeding fermented grains with a sprinkling of raw sesame seeds. I don’t know how long this will work, but I’m hoping it will do the trick until she stops laying. If it becomes ineffective, I think I will give Amy’s suggestion a try. Very interesting post because I too have the same problem with my 3 year old Hybrid. I have tried everything from Limestone Flour, liquid calcium in water and, of course, they have grit and oyster shell available all the time. I am going to look up the calcium Plus Powder that Amy suggests. I also had the same idea as Jan – in that if anything happens to my hybrids I would try pure breeds as I too believed they would have less laying problems. I wish that my hen would stop laying all together now. Do hens have a certain amount of ova and when these are used she obviously stops laying or do they continue to produce? I try to learn as much as possible about chickens, but sometimes I seem to get conflicting advice. I am always very grateful for your advice Terry and trust you implicitly with matters of the feathered flock. Thank you. My hen Doodles had same issue with eggs with no shell, ghost shell, hard to pass, etc. off and on for about a year or so. A couple weeks ago she was in great distress and really looked like she needed to be euthanized. I tried the epsom salt baths and putting her in a container to rest and feel safe. Not much happened from all of that as far as I could tell. I made an appointment to see the Avian Exotic vet who sees a lot of rescue hens and appears to know what they are doing, but that morning she passed the egg. There was blood…the egg was broken and I had to gently remove some that did not quite come all the way out; however Doodles seemed greatly relieved!! Doodles has been with me since she was around 2 months old and she is now 8 years old. I took her to vet and sprang for the implant to stop her from laying for awhile. She needs the break and I may continue to do that. Who would not be tired after laying an egg almost every single day for 8 years with only small breaks in the winter! I feel that chickens, like most prey animals simply are not set up for the long haul. To expect them to keep up the incredible egg laying late in life just seems inhumane. By the way, the vet said when the eggs have issues coming out and everything does not happen in a timely fashion or they are malformed, they most likely contain a bacteria and should not be eaten. 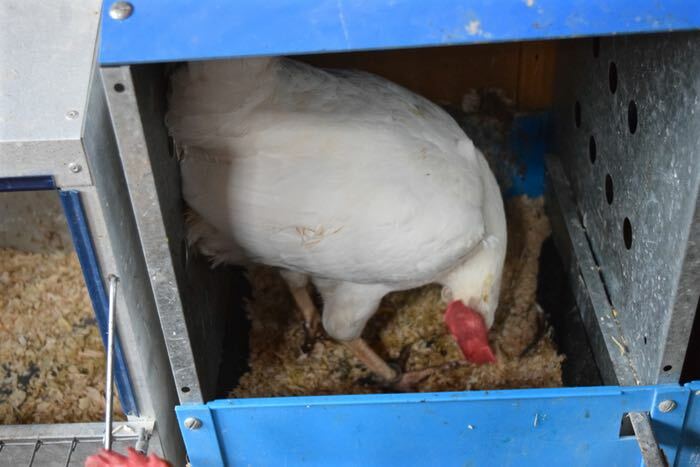 She also stated that if the hen lays and or eats that type of egg, she most likely will develop a bacterial infection which needs to be treated with an antibiotic (TMS). Thank you for this site where folks who care about their chickens as individuals can share information. I’ve seen hens have difficulty laying eggs because of a viral issue, (a virus that does not affect people.) I’ve also seen them have laying issues do to blockages such as cancer. Malformed eggs can be due to lack of calcium, not a bacterial issue. 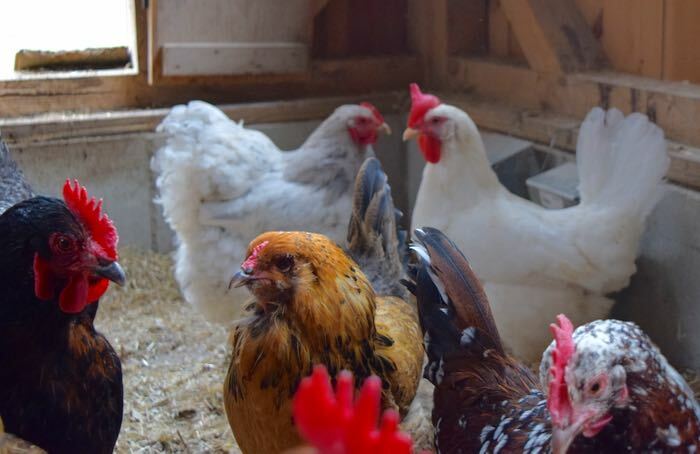 Most bacterial issues that affect hens are not bacteria that harm humans (although some, like certain salmonella, do.) That said, I never eat eggs that are compromised because without the protection of a shell they can become infected with harmful bacteria, like the aforementioned salmonella. Eating those eggs don’t cause the hen to develop a bacterial infection, however often when the hens does have laying issues, the eggs that are stuck in her do become infected. Although antibiotics can alleviate the short term symptoms, the long term prognosis is not good. I don’t. I do believe that it is valid to weigh the cost of treatment. I believe that hens who survive past 4 years are living charmed lives. If they can remain healthy beyond that, through basic good care and TLC, that’s wonderful. If major things go wrong, then it’s time to let them go. That said, each person has a unique relationship with their flock and the individuals within it. If the treatment doesn’t extend suffering then you can consider it. 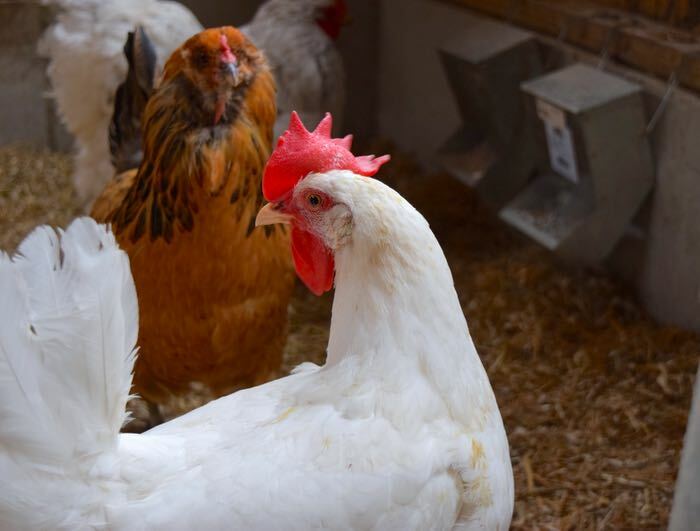 Unfortunately, by the time treatments are recommended, there’s a lot amiss inside of the hen beyond what can be determined by an external evaluation. Thankyou, your reasoning is always spot on. My concern also was that internal damage could already be there. Although it is very sad to let them go it is better for the hen not to suffer, I believe going to the vets once or twice a year for the rest of their time could be very stressful. ( I had first thought it was done once and that was it not that it had to be repeated ). Don’t let her eat the egg! it has bacteria that they can get sick and die from! My barred-rock passed a few weeks after she was eating cracked eggs! I should add for clarification that my hen I am now getting the hormone injection for appeared under zero stress at the vet. Ate and walked around while there and then came home and continued on with same. She is around people a lot and socialized with a wide variety of other animals. I think that makes a difference, the frequent and extensive contact. She is 8 but not a factory/breeder type hen, which I have read often can have a variety of issues after about 3 years old. She is a Mexican “native fowl”. She had Spurs. She also has a life style that has included residing in a very large walk in type enclosed area with everything a hen could want. Additionally each day I sit with her on my property while she goes about with eating all sorts of bugs and greenery and taking her daily dirt bath. Definitely the life I wish for all hens and I believe is a big contributor to her healthy and happy state at 8,with the exception of having to come up with all it takes to lay an egg so frequently; thus the injection. I will send Terry a pic as I do not know how to post a pic on her site. Yes thanks for this post. I am going thru the same thing with NHR. She is 4 years old. Good info as always. Loved this post, Terry. The fact that you’ve “had eyes” on your flock, carefully and thoroughly, means that you have seen much, handled much and been able to evaluate much. When I get my girls, I am using your chicken sense and experience as my guide. “When treatment extends suffering” is such a powerful statement. May we all remember that. There are some hazards to online communities, in that often they are a forum for feeling the support for a point of view or action we already may have or are doing. (Rarely will one find a person that goes to sites which have a point of view they do not like or share) That is why sometimes bringing up new ways of approaching issues can be challenging for some. I recall when I brought up my rooster and my experiences with him, along with information that cockfighting was still going strong in many states, some were a bit incredulous. I know many of you value Terry and her years of practical experience. I do too and that is why I read information from this site and contribute to it with $ periodically. However, do your own research people! Don’t be such a flock. Actually, this isn’t a forum. It’s my personal blog with my point of view. There are plenty of forums out there where you can get lots of “advice” and contribute any number of ideas. That’s not this blog. Although I appreciate comments, I keep things focused and civil. As far as doing research – I do my best to look at primary scientific research, and then distill it for my readers. I also try to give a kind, but practical perspective. My readers do not be need to be told “don’t be such a flock.” They don’t follow me blindly. They do appreciate my perspective. In this question of whether to do implants or hormones, I’ll come out here a bit stronger. I don’t believe in going to extreme means to extend a hen’s life. I don’t believe in the expense. I don’t believe that it’s in the best interest of the chicken. 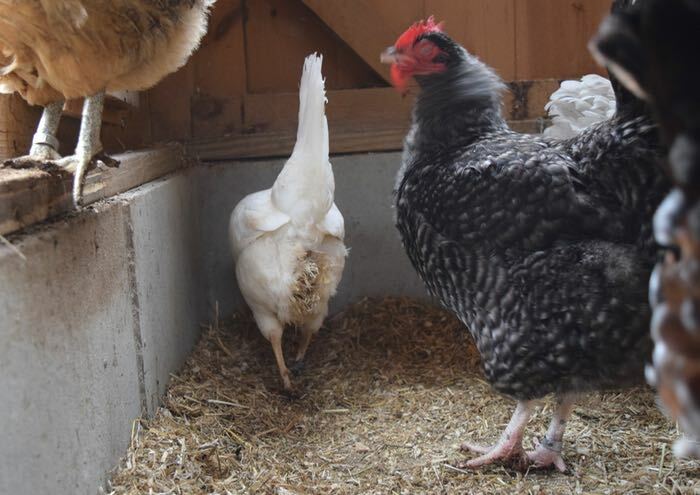 Hens that need a break from laying have many other problems going on inside of them as well. Also, the drug, suprelorin, is approved for ferrets only. All in all, on so many levels, I don’t approve. If you don’t agree, fine, but this isn’t the forum for a debate. Well put Terry, we don’t follow blindly but do appreciate your research and advice. I had a bantam vorwerk (Amber) who always struggled to lay her eggs right from the start. I considered the implant but when I researched it and realised it had to be done every six months I decided it was not for me. She didn’t like being handled and it is also expensive. Also I am not sure about interfering with nature if it can be avoided. I gave her the best life I could give her. She didn’t lay often, luckily, and in her third year she laid one egg then stopped laying and looked the best she had ever looked. She was busy, talkative and had a red comb and wattles. She was all over a broccoli stalk one evening and then dead just outside the pop hole at first light the next morning. I guess that whatever was wrong with her finally got her but I felt lucky to have her three years and not to have her suffer or to have had to make the decision. She was a feisty little thing and I still miss her, that was last April. 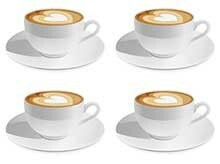 Wonderful blog Terry! I do learn a lot from readung your blog! About chickens and your approach to horses. Thank you for this one in particular, as it is scratching on the problem side not just showing the sunny side of life with our feathered friends!